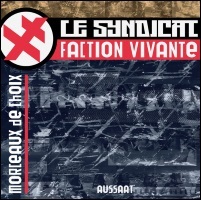 Le Syndicat formed in the early eighties and were part of the first wave of French industrial music producing noise and what they called bruitist music. Looking over some past reviews that appeared in the back issues of Compulsion I see that Le Syndicat veered between industrial noise and heavy electronic beats. Le Syndicat were always willfully diverse and with Le Syndicat Faction Vivante, a new duo formation featuring original member Ruelgo along with Saphi, which has evolved from Le Syndicat as principally a live proposition where they perform with live projections. Their aim is not to repeat what has gone before. Morceaux de Choix was recorded at their home studios and features excerpts from live sessions that took place between 2014 and 2015. It is fittingly released by Aussaat, a new label operated by Will-i Stasch, another stalwart of the industrial scene who edited The Feverish and distributed a number of Le Syndicat tapes in the early days of his previous label Cthulhu Records. It's a blistering maelstrom of noise and effects taking in noise blasts, distorted noise, squidgy effects, ringing and suspended electronics, knocks and raps and much more besides. Sounds are layered, fold in on themselves, and are cut and dropped in. And this is just the first track, 'Rouge'. The sounds Le Syndicat Faction Vivante are dealing with might be familiar to seasoned industrial and experimental electronic listeners but there's little rhyme or reason to the structure. It's formless and chaotic as as it rapidly switches between brutal noise and experimentalism. But let's back track a bit to see if there's a method behind this apparent sonic madness. In a statement issued to accompany Morceaux de Choix Le Syndicat Faction Vivante stated: "The vast range of our tools, some extremely modern and others totally home-made, allows us to spontaneously develop a multitude of sound forms that exist outside the restrictions of conventionally improvised music." They continue, "Thanks to this equipment and to the intensive practice, we have undergone through several decades, we can free ourselves of all our inbuilt cultural restrictions and accept what can exist in the flow of sound and silence." It's an interesting concept that doesn't really conform to entertainment. As you listen you try to impose some sort of sense to the fast changing disorientating sounds but it's pointless, even the artists are surprised by the randomness and unpredictable sounds generated by the source equipment. It is a process they call "reflex piloting" where the artists abdicate control to the point they almost become operatives in the process, as the machines generate unexpected and unpredictable sound forms. And what do those sound forms sound like? Morceaux de Choix pivots between industrial noise and electronic noise with rhythms and then something of an amalgamation of the two. But that's just a loose description as although there's no shaping or sculpting of the sounds the rapid switches and chance elements result in a dynamic and disorientating complexity. 'Opiniâtre' comprises heavily processed and filtered electronic noise littered with generated effects and frequencies. Its manipulated noise is kind of akin to an instrumental take of Whitehouse's later material such as Bird Seed. Meanwhile, with its chaotic blend of industrial noise careering between feedback and screeching frequencies and bursts of noise distortion 'Alarmique' could almost be drawn from the first wave of eighties industrial. Other tracks, while smothered in processing and distortion, are more rhythmic like the cascade of pounding and hammering rhythms that comprise 'Eargasm'. 'Pente en Force' launches from a series of tones, noise and frequencies before picking up on a series of jabbering rhythms; the entire thing surges back and forth, continually dropping elements whilst sweeping up other sound forms as it careers onwards with a propulsive intensity. 'Hahicru' wrestles and jostles with industrialised noise and erratic rhythms and the noise storm of 'Réplique' which is subject to speed shifted processing pales when compared to the spontaneous generation of sounds found on tracks where it seems the machines have taken over and chaos reigns supreme, like the cut-up and spliced assemblages of 'Engrenages' and 'Papillons de Fer' which unleashes rhythms and short treatments of distorted noise and rhythmic clatter and the closing 'Chanson Drôle' with its multi-speed and spliced manipulations of noise tones, frequencies and squelchy squeaky effects.